Hey Google, you don't really want to replace me, right? Google wants to do more than just organize the world's information. It wants to infuse itself into our lives and replace several of our daily tasks robotically. That, clearly, is the goal, as outlined this week. Forget about those shiny new Pixel phones, tablets and speakers that Google announced this week at a splashy event in New York. Or a new talking video speaker that takes on Amazon's Echo Show with a focus on Google visuals like mapping, calendar, and, of course, all that YouTube content. That’s cool. But the stuff we care about – you and I – that we would actually use, comes down to Google's attempts to clone us. Consider some of the artificial intelligence advancements that the company touted this week. •Screen your calls and transcribe them on your behalf, in real time. Let's begin with Duplex, the controversial new AI tool that has Google placing calls to restaurants and hair salons, to set up appointments without you having to do it. First announced in the spring, Google said this week that Duplex will begin tests this month for Pixel owners in four cities – San Francisco, New York, Atlanta and Phoenix. Cool for you, but weird for the restaurant staff that already gets too many odd phone calls. Now, a computer is calling and sounding awfully realistic. In a note to businesses this week, Google said they’ll always be able to tell that they’re speaking to a robot, and that there will be an opt-out feature to refuse the calls. 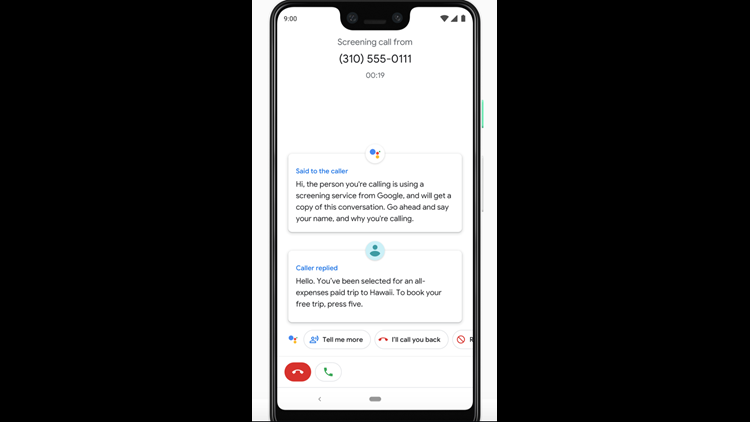 Speaking of calls we don’t want, here comes Google’s Call Screen. This is aimed at scaring away telemarketers. Instead of hanging up immediately on them, as so many of us do, Google has another idea – let the Google Assistant take care of these rodents. Get a caller you don’t recognize? Click a button and let Google figure out who is on the other line, and whether you really want to take the call. It’s a variation of the old screening of calls picked up by answering machines that we used to do. In real time, you will get a transcript and that chance to decide whether or not to pick up. I love this and hope Apple feels inspired to steal it for iPhones. But let’s be real: This isn’t going to solve the problem. Telemarketers will hang up immediately, and the real culprit is the automatic robocalls, which the Call Screen feature won’t be able to help with. But it’s a start in the right direction. But we still have to do the basics with Google. In searches, we type or say queries aloud. No robots have swept in yet to replace our curiosity. But give Google a few years, right? Waze, the navigation app used by over 100 million people daily to find the best routes around town, opened its carpool service to all 50 United States, after tests in California and Israel. Via the Waze Carpool app, riders can seek lifts from local Wazers or offer their driving services within the main Waze app. The intent isn't to get rich but to get cars off the road and help you, the driver, get to work faster by having another passenger to qualify for the carpool lane. Rides are a flat rate $2 through October and then will be 54 cents a mile. Microsoft bringing Xbox gaming to phones. Microsoft will soon test new streaming technology to let users play Xbox games wherever they are, including on phones and tablets. Warner Media, the new name for AT&T's entertainment division, which includes the Warner Bros. studio, Turner TV networks (CNN, TBS, Cartoon and more) and HBO, said it would launch a new streaming service in 2019. Google said it would shut down the little used Google Plus social network this week, in response to a massive security glitch. Despite so many people having Google IDs for Gmail, YouTube and other Google services, Goggle wasn't able to join Facebook, Instagram and Twitter in creating a popular, robust social network. We're back from a week in Japan, where we enjoyed checking out the high-intensity, eight-story Yodibashi-Akiba electronics shop. Check out our report on the useful, crazy and downright weird gadgets we saw during our visit. And here's our video, shot in crazy TimeWarp super high-speed on the new GoPro Hero7 Black camera, of our visit to Yodibashi. •Waze's ambitious plans to make carpooling mass market. That's a wrap for this week's Talking Tech newsletter. You can subscribe at http://technewsletter.usatoday.com, listen to the daily Talking Tech podcasts on Stitcher, Apple and Google Podcasts, and follow me (@jeffersongraham) on Twitter, Instagram and YouTube.